All new Mailchimp accounts start on the Forever Free plan, so we don't ask for payment information right away. Paid plans are based on audience size or the number of emails you send, and payments are made upfront. No matter what type of plan you choose, you don't need a contract. In this article, you'll learn how to access and edit your billing information. We accept PayPal, all major credit and debit cards, SEPA Direct Debit, Klarna, Giropay, and iDEAL. Discover and American Express cards are not supported by all currencies. Mailchimp uses a secure and well-established credit card payment gateway service to process your payment. Review our credit card troubleshooting guide if you have a problem. You always have the option to change your payment method. Depending on the currency you use, you may want to connect a PayPal or direct debit account. To change your credit card information, follow these steps. Click your profile name to open the drop-down menu and choose Account. Click the Billing drop-down menu and choose Billing information. 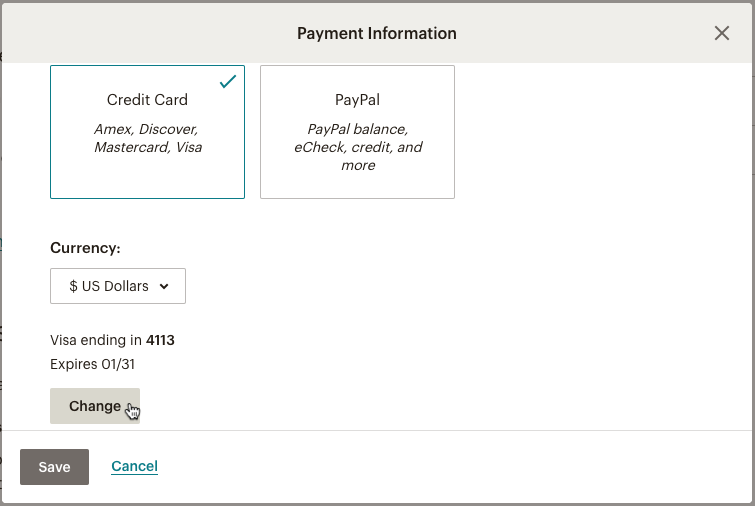 In the Payment Information pop-up modal, scroll down and click Change. 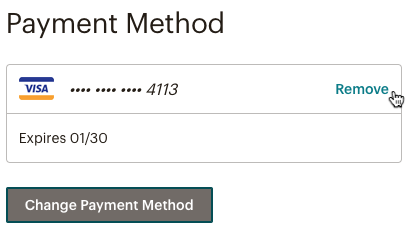 In the Credit Card Details modal, enter your card number and expiration date. 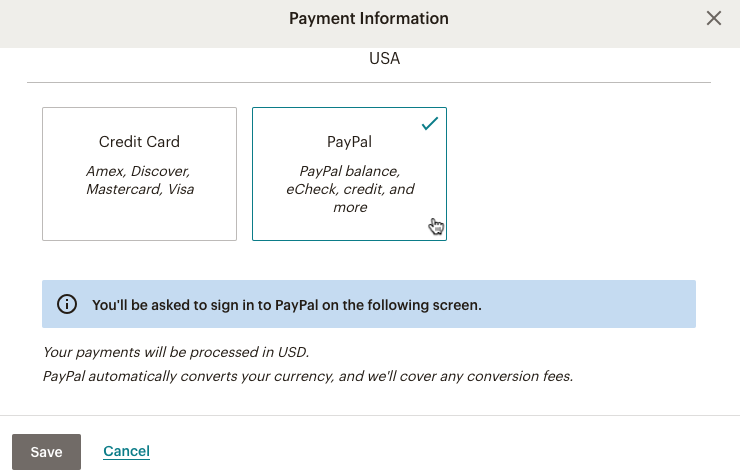 The Edit Payment Method pop-up modal defaults to the credit card option, but you can choose to pay with the preferred payment method in your PayPal account. All PayPal transactions are processed in US Dollars, but currency conversion fees won't apply. To connect your PayPal account, follow these steps. In the Payment Information pop-up modal, click PayPal. Click Save, then log in to your PayPal account when prompted. If you don't see the pop-up window, check your browser's pop-up blocker settings. In the PayPal pop-up modal, click Agree. Users in Belgium, the Netherlands, Austria, or Germany can choose to pay with SEPA Direct Debit, Klarna, Giropay, or iDEAL. These transactions are processed in EUR. 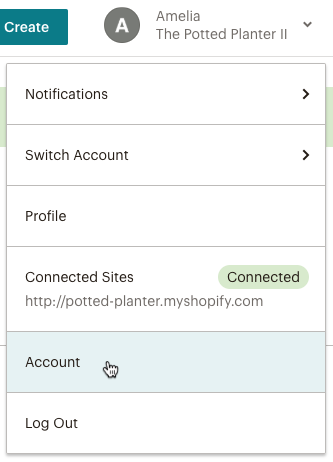 To connect the payment system to your Mailchimp account, you’ll need to complete a purchase. If you want to connect but don’t need to make a purchase yet, we’ll charge a 1 EUR setup fee to your account and refund it on your next billing statement. To connect your account, follow these steps. In the Payment Information pop-up modal, click Other. Choose your plan or complete the 1 EUR setup purchase. Click the payment method you want to choose. 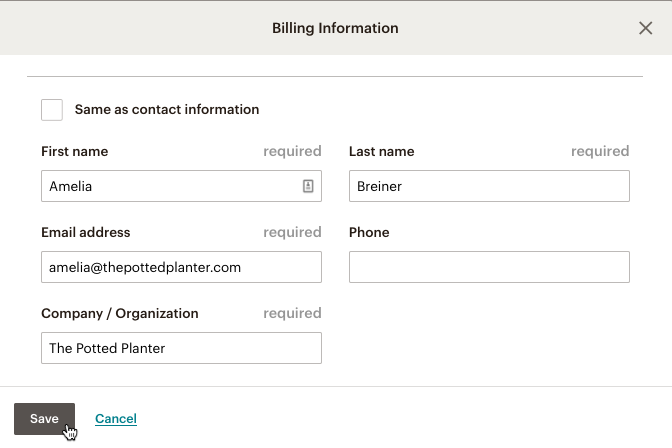 Depending on the country listed in your Mailchimp billing address, you'll see different payment options. Enter your bank and account information and click Continue. Review your information, and click Pay. After the purchase is complete, your payment method will update. Billing information can also be reviewed and updated on the Account Overview page. To access your Account Overview, click your account name to open the drop-down menu, and choose Account. Scroll to the Monthly plan section. 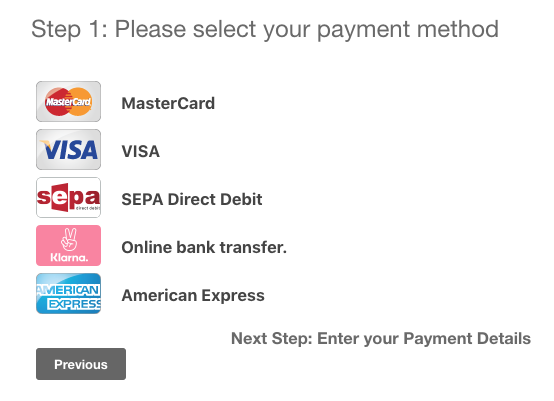 If you want to switch from one type of payment in the Other category to another, like SEPA Debit to Giropay, you'll need to remove your current payment method before you set up the new payment type. If you want to be billed in a different currency, you can change it at any time. We'll convert payment amounts based on current exchange rates. Learn more about pricing for international, non-U.S., and other currencies. To change your billing currency, follow these steps. Navigate to the Billing information page. 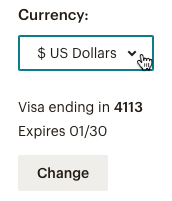 In the Payment Information modal, click the Currency drop-down menu, and choose a billing currency. After you change currency, you’ll need to re-enter your credit card information. Click Change. 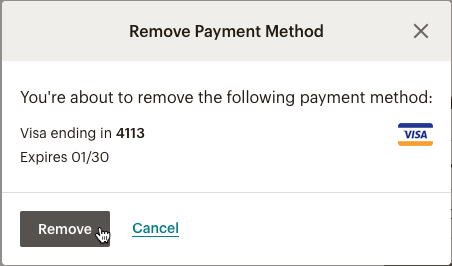 You can delete your payment method if you no longer want to use it, or if you don't want to store that information in Mailchimp. You will need to add a payment method next time a payment is due, or when you make a purchase. To remove your current payment method, follow these steps. In the Payment Method section, click Remove. In the Remove Payment Method pop-up modal, click Remove. Receipts are available in the Billing history section of your account. We also email a transaction receipt to your account’s billing contact after any order is processed. We don’t support purchase orders or offer invoices for paid plans. If you need a copy of a receipt, W-9, or a Tax Residency form, you can view and print these documents from your account. 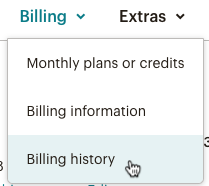 Click the Billing drop-down menu and choose Billing history. Click the name of the transaction you want to work with, or click View. 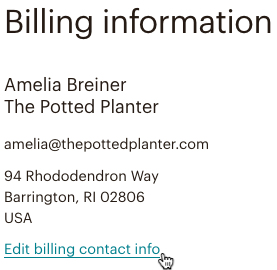 Click Print to open a printer-friendly version of the receipt, or click the drop-down menu and choose Email Receipt to email a copy of the receipt to the billing contact. Each transaction also contains links to our W-9 form and United States Residency Certificate. To view a printable PDF of the form you need, click Looking for our W-9? or Looking for our United States Residency Certificate? We use your billing contact information for all billing correspondence. You can edit this information at any time, and you can include optional details like a TAX ID. To edit the billing contact information for your account, follow these steps. In the Billing Information pop-up modal, edit your information. Check the Same as contact information box to use the information from the primary account contact. 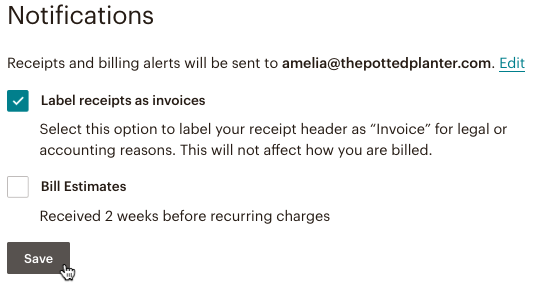 You can edit the billing notifications you receive at any time under the Notifications heading on the Billing information page. Click Edit to update the email address that receives billing notifications for your account. Choose this option to label your receipt header as "Invoice" for legal or accounting reasons. 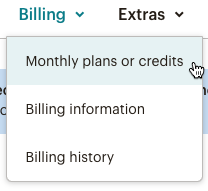 This option will only change how receipts are titled, and will not affect billing dates for monthly charges or Pay As You Go credit block purchases. Check the box next to Send bill estimates to receive an estimate of your upcoming charge. If you're a Pay As You Go user, check the box next to Send Pay As You Go alerts and enter the minimum number of credits allowed in your account. When your credits fall below that number, we'll send you an email alert with a link to buy more credits. You can also choose to be billed automatically at that time.